I am currently a graduate student at NYU's Interactive Telecommunications Program. Here, you can follow what I am working on throughout my time there. Here is another example of the Bullet Time effect, but on a much more affordable scale than the Matrix budget. Using disposable digital cameras they managed to put together a rig to experiment with the effect. The focus on this project was to use the resulting images as a basis for temporal-spatial experimentation in relationship to the viewer. You can see videos on the project’s site. In thinking about the idea of morphing and merging, the terminology leads me to think of a distorted representation of reality. In regards to distortion, Slit-Scan images come to mind as a good example of this relationship. Golan Levin has compiled “An Informal Catalogue of Slit-Scan Video Artworks and Research”. As well there are some ITP folks who have experimented with this technique and some basic processing sketches you can try out if you are interested in doing some tests of your own. To focus on an example that relates well to the nature of this course, Michael Awad created a work called “The Entire City Project”. 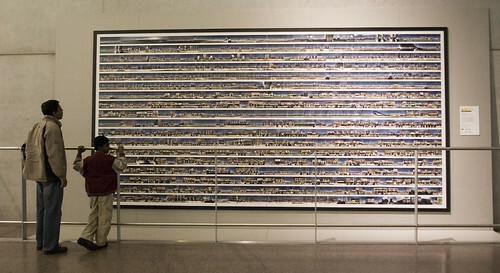 The basic idea of the project was to take panoramic Slit-Scan images of a significant portion of the city of Toronto and then assemble them into an installation within the city’s major airport. In a related project, he teamed up with Evan Penny using portraiture to turn these types of images into 3D representations. 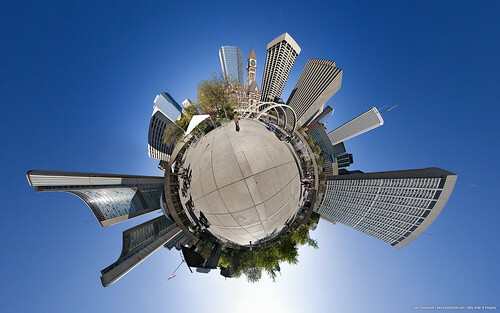 As another example of people creating misleading representations of reality, here are a few links to do with Polar Panoramas (aka little planets). There is a flickr group dedicated to these images if you would like to see more examples. If you would like to try creating any there are plenty of tutorials in the forum. My photos. Now you know me.